Rabbit Island, Japan. Yes, you read that right. On the small Japanese Island of Okunoshima lies a land filled with enough Peter Cottontails to fulfill all your childhood dreams. I couldn’t believe it when I heard about this place, and knowing I couldn’t miss it I hopped on the next ferry out. As the crew from the Okunoshima ferry waved bye to me and traveled onward to their next destination, I realized it was just the rabbits and I.
Japan is a world of great mysterious to most Westerners. Japanese culture and people tend to be very reserved and quiet. Although polite, some Japanese may try their best to avoid you; in part due to language barriers and also because of their homogeneous way of life. You’ll find that the streets are so quaint and clean you could pick gum off the sidewalk and continue chewing for hours. Amidst all the calmness, you will also find the crazy, out there, dreamlike places and things that baffle us visitors at first glance. It began when I started chatting with another Japanese speaking American while visiting the picturesque Fushimi Inari-Taisha shrine in Kyoto. We were sharing similar culture shocks from our visit to the nation when he said it. Instantly hooked. I probed for more details, but he could answer none of my questions. I turned to the internet as soon as I returned to the hostel, searching for “rabbit island, Japan”. Google Images was my savior, there was the proof – BUNNIES. This place existed, and since I had the JR pass, I had no excuse not get there. I had no itinerary during my three weeks in Japan, so I was able to map my travels in order not to miss Okunoshima (even though a couple of Japanese locals tried to talk me out of it). I rode the train along the coast to the Tadano-Umi station. Getting off in what looked like an industrial town. In extremely broken Japanese keywords mixed in with me hopping and repeating “Bunny” in English, I was able to get on the next ferry out. Hi, Human. Wtf are you doing here? It was a hazy, overcast day in February, but winter in the Chūgoku region surprisingly turned out to be pleasant and mild. Needless to say, tourism was down, and I was the only passenger on this ferry. I wasn’t at all surprised, given that I had just stayed at a hostel where I was the only guest. When the Okunoshima ferry arrived 20 minutes later my heart started racing, the internet did not lie, all I could see were bunnies everywhere! I got off to explore and play with the endless amount of bunny rabbits. But I could tell they were going to have no interest in humankind without some kind of delicious persuasion. My old edamame shells had seemed to do the trick for a short amount of time, but this would not sustain the bunnies. I walked further and further into the island until I came across a large hotel appearing like it was still in development. They turned out to be open and welcomed me in so that I could get some food to feed the rabbits. This place would be a walk in the clouds for the Easter bunny, and there would be no shortage of friends for Bugs Bunny. I didn’t know where to start! Which lucky rabbit will get the most of my kibble? I wanted to find the cutest bunny and cherish him. 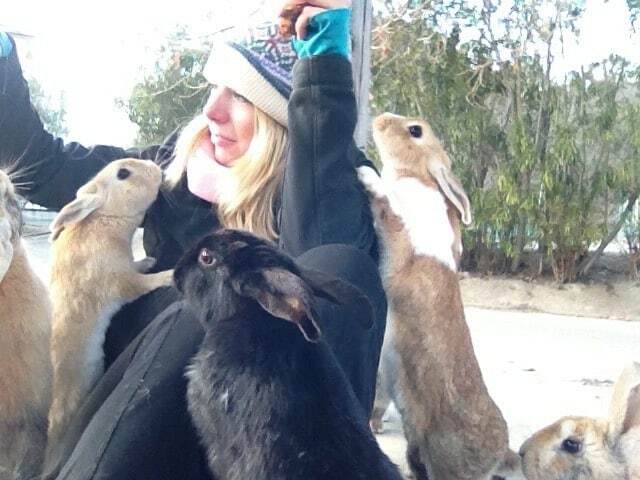 Instead I handed it out like Oprah, and soon I was swarming with bunnies all over me. I was the only human in sight i.e. the Energizer Bunnies source of energy. So how did all these bunnies get here? During WWII, the isolated island served as a top-secret location for a poison gas factory. Rabbits were used as test subjects for chemical weapons such as tear and mustard gas. However, there is no proof that the bunnies now days are direct ancestors from their wartime friends, so no one can say exactly for sure why the island is inhabited by over 800 bunnies now. Besides the bunnies, around the island are information points about the war, a Poison Gas Museum, and ruins from the gas plants used. After a couple hours on rabbit island, I was still shocked that I had not seen one other tourist venture onto the island. The selfish part of me enjoyed the winter time where I could hoard all the bunnies to myself. After hours of quality time, I had gotten to a point where enough fur was enough. Crawling with bunnies I now wanted them off me and to leave with dignity. I timed my walk back to the dock to match the last ferry outward. I could now say that I had been to rabbit island in Japan and would go back in a heartbeat. The only way to get to Rabbit Island is via the Okunoshima ferry. From Hiroshima take a train or a bus to get to JR Tadanoumi Station. Once you step out of the station turn right and the ferry terminal is less than a 5-minute walk. You will get to a booth with a giant bunny billboard. From the mainland to Okunoshima takes less than 20 minutes and takes about 12 mins costing 620 yen. Have you been to rabbit island in Japan? 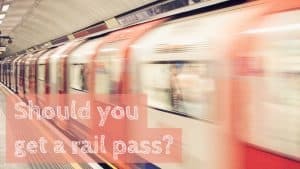 Please tell us about your experience in the comments!